One of the many tasks our team has to carry out is of course the purchase of stamps from countries around the world. Our very own Julie is the one responsible for ordering the stamps either online or by telephone. As expected, this task comes with certain perks. To be more specific, as the amount of stamps we buy is worth thousands of euros each time, the various postal services from around the world always make sure to include a few unique gifts. Julie mostly uses these gifts to decorate the walls of her office. This has slowly converted Julie’s office into a small stamp gallery. 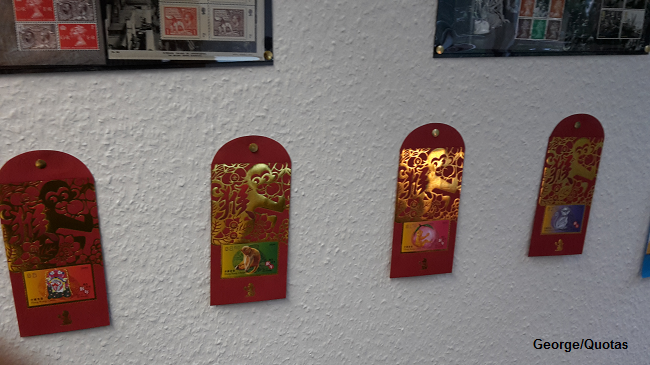 In the picture above we can see a recent arrival of decorative stamped envelopes from Hong Kong celebrating the year of the monkey.